The word “occupation” invokes differing definitions in the Arab realm. All involve Israel but the precise connotation depends on the context. Liberal-hearted foreigners, whose sympathy and political support is sought, are told that occupation refers to lands Israel took (obviously out of unadulterated malice) in 1967. Unless these arbitrarily usurped territories are ceded, Mother Earth will know no peace and harmony. But Arab/Muslim listeners discern other undertones. For them any Jew’s presence, even inside Israel, amounts to sinful and insufferable occupation. Rectifying that wrong means terminating the existence here of all Jewish trespassers. This ethos was given emotive lyrical expression by Mahmoud Darwish – the late “Palestinian national poet,” once an Israeli-Arab Communist, later a PLO luminary and author of the Palestinian “Declaration of Independence.” Even post-Oslo, with its derivative coexistence prattle and two-state propaganda, Darwish’s verses encapsulate the ideology of his fellow Fatah leaders – Ramallah chieftain Mahmoud Abbas foremost among them. Darwish contemptuously labeled Israel’s Jews “those who pass through passing words.” He dehumanized Jews by referring to them as ephemeral despicable parasites – “flying insects” – spiteful transient interlopers, bound to depart without trace, leaving no vestige of ever having sojourned here. He steadfastly and unabashedly rejected any Jewish connection with this land, any history or right to remain here. He was the ultimate unrepentant advocate of ethnic-cleansing and – barring that – of outright genocide. Abbas said exactly the same, only in prose, at the recent three-day International Conference for the Defense of Occupied Jerusalem in Doha. Prime Minister Binyamin Netanyahu accused him of incitement but hardly anyone bothered to fathom why. The media preferred to dwell on the price of chocolate in Israel because that promises sweeter payoffs for the left-wing agenda. This, though, isn’t merely a case of media manipulation. There’s also news-consumer fatigue. Quite naturally dog bites man arouses little attention or commotion. Nothing unusual – even if we don’t remember the date and incidental details of every time canine teeth snapped at homo sapiens’ heels. So it was when profusely self-professed moderate Abbas yet again insisted that Jews can claim no attachment to Jerusalem, that a Jewish temple never stood atop Temple Mount, that Temple Mount isn’t Temple Mount, that it never was anything but a Muslim shrine, that alien Martians calling themselves Jews descended upon Jerusalem from the void in the 20th century, that these extraterrestrials conspire to overrun that Muslim site, that they even construct vile architectural models for a futuristic temple with which they plot replace the sacred Muslim compound. Were this the first occasion we heard such drivel, we might wax a tad indignant. However, we’ve been told so frequently that we are figments of our own imaginations that we’ve grown inured to the blather. We might not recall each time we heard how rootless and history-deficient we are, but the sum total coalesces at the recesses of our consciousness to form a dim collective memory. Basically we’re hazily cognizant that those who bay for our blood also remind us every so often that we appeared out of nowhere and that the noble Arab nation will dispatch us back to oblivion. This theme is so common and consistent that its incessant reiteration leaves us frankly unmoved. But it shouldn’t. This coldly calculated calumny constitutes prelude to mass-murder. It had already led to horrific bloodletting in the past and will do so again. Throughout 1928, infamous Jerusalem mufti Hajj Amin al-Husseini, railed about nefarious Jewish schemes to take over al-Aksa. To boost his counterfeit contentions he had photo-montages made up of Theodor Herzl on the Temple Mount. The fact that Herzl died in 1904 proved no impediment to implicating him in posthumous conquest conspiracies. By August 1929, Husseini’s spurious accusations ripened into a series of premeditated pogroms throughout the country. The most notorious was in Hebron, where 67 members of the ancient Jewish community were hideously hacked to death. Husseini – who later became a Berlin-resident avid Nazi collaborator during WWII and a wanted war-criminal thereafter – is still widely revered throughout the Arab world and especially in Abbas’s latifundia. It’d do us well to recall that the 2000 intifada was launched to the accompaniment of similarly drummed-up and trumped-up takeover hysteria, supposedly triggered by Ariel Sharon’s visit to the Temple Mount. At the time, Abbas’s predecessor and patron Yasser Arafat scoffed at any Jewish historic tie to Temple Mount, maintaining that no temple ever existed there. Arafat then violently scuttled the Camp David deal-that-nearly-was, despite then-Premier Ehud Barak’s egregious generosity and readiness to accede to nearly every Arafat demand on Jerusalem. And Arafat’s torchbearers stand at the ready; Abbas has just exhorted them. And just like Arafat, Abbas too is remarkably in sync with the most extremist agitators in Israel’s own Arab sector. Shortly before Erekat disclosed Clinton’s desperate efforts to reason with Arafat, Islamic Movement Northern Branch leader Sheikh Raed Salah, a convicted Hamas collaborator, addressed Arab students at the University of Haifa (of all places) and urged them to die as shahids (martyrs) in the war against Israel. He charged that Netanyahu “aims to implement plots hatched during his previous term and complete the takeover” of the Mount. How will that takeover be facilitated? According to Salah, “Netanyahu’s design is to dig tunnels under al-Aksa and replace it with a Jewish Temple.” He added: “We won’t compromise on our principles or holy sites. We prefer to die as shahids and will welcome death joyfully.” Salah’s audience of about 100 enthusiastically responded with shouts of Allahu akhbar (God is great). He has orchestrated riots against archeological rescue-digs and the still unconstructed new pedestrian bridge to the Temple Mount. He accused Jews of “eating bread dipped in children’s blood.” He praised and eulogized terrorist murderers. He threatened with “ghastly death” anyone who claims any Jewish link to the Western Wall, “even to just one stone.” He regularly holds “Save al-Aksa” rallies – just like the sort Abbas sponsored in Doha and which Arab-Israeli MKs, bankrolled by taxpayers like you and me, attended. Abbas charged that Israel seeks to Judaize Jerusalem, an assertion which requires us to expunge from mind the fact that Jerusalem has had a solid unshakable Jewish majority ever since its first census in the early 19th century (there were no censuses beforehand). He then proceeded to allege that Israel aims to erase Jerusalem’s Christian past as well. But isn’t that precisely what Abbas does when he denies the existence of any Jewish temple or Jewish history in Jerusalem? How could Christianity as we know it have arisen without Jewish Jerusalem? The New Testament is packed with seminal references to Jewish Jerusalem and its Temple, the very ones pooh-poohed by Abbas. Thus Christianity’s self-appointed guardian undercuts the crucial foundations of the Christian creed. Finally, Abbas declared that Israel impedes Arab visits to and worship in Jerusalem. This is colossal gall. Not only is this Holocaust-denier lying, but look who’s talking! In 1948, brazenly contravening the UN Partition Resolution, the Arabs – with Jordan at their vanguard – invaded and occupied the Old City of Jerusalem. They expelled its ancient Jewish community and lay siege to West Jerusalem, striving to starve it into surrender. 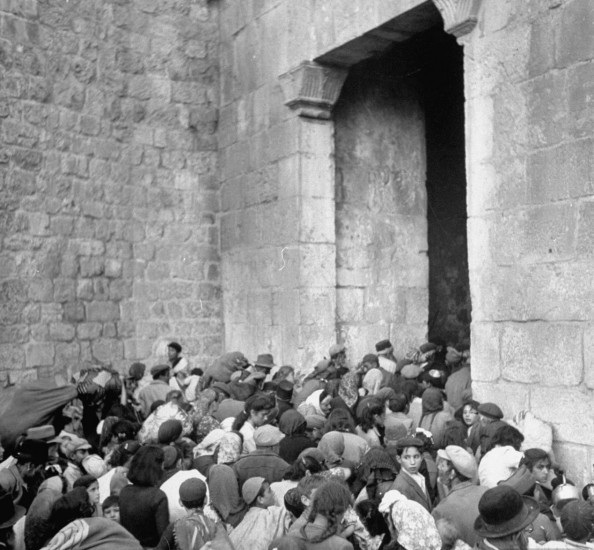 The armistice agreement, which ended the 1948-49 Arab aggression (Israel’s War of Independence), guaranteed Jewish access to Jerusalem’s sacred sites. Nonetheless, all solemn Arab undertakings were callously breached. During Jerusalem’s 19 years of brutal Arab occupation (1948-1967), no Jewish worship was possible at the Western Wall or elsewhere, formal international commitments notwithstanding. Foreign visa applicants even had to prove they weren’t Jewish, lest a forbidden Jewish foot reach Judaism’s holiest site. Fifty-eight synagogues in Jerusalem’s historic Jewish Quarter were destroyed or defiled, some used as cowsheds, stables or public latrines. Many were razed to the ground. 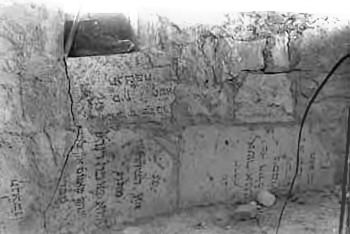 The incomparable Jewish veritable-pantheon that is the 3,000-year-old Mount of Olives cemetery was sadistically despoiled. Over 75 percent of its tombstones were ripped out and used to construct anything from pavements to army barracks and even communal urinals – the ultimate humiliation and desecration. This wasn’t mere vandalism or an outpouring of unbridled hate. This was maximal ethnic cleansing, purposely planned to purge Jerusalem of its Jewish past and pretend it was never anything but Arab. “The usurper’s flesh will be my food. All of us are the usurpers whose livers are destined to be devoured. Abbas’s slander is intended to justify the feeding frenzy. ……….and so many in Israel ignore all the warning signs and still go along with appeasement and surrender of Jewish land to these mad dogs, foaming out their hate from the recesses of hell. This Jewish tolerance for evil and unending drive to reward it is in itself evil. HOW could it be, that anyone in his right mind, would give up anything of Israels vital achievements of 1967…??? NOT ONE SQUARE INCH !!! The Arabs will never rest to plan and to plot the destruction of the Jewish state…any form of appeasement, like the flawed Oslo accords will only play into their evil hands. better reasons to feel so. Hatred begets hatred.That is the immutable law of karma.Better to just watch the various segments sprung from the great hater,sbuh, destroy each other. Thank you Sarah for your powerful reminder! Jews who are again distancing themselves from Zionism, as did so many German Jews before Hitler. Here and elsewhere, the Jews are again lulled to sleep by their material successes. Others, left-wing universalists, are openly hostile to Israel. Assimilation or Zionism still is the choice that divides us. We appear not to understand that antisemitsm is eternal. That eternal vigilance is the price of our survival. As always, a brilliant and moving article from Sarah. We are in fact in the midst of a world war, a war that will probably be more etrrible and more challenging than both the Shoah and WWII combined. Now, as then, some of our worst enemies are God forbid Jews.Israel is a modern nation seriously threatened with total annihilation by an unrelenting enemy Islam that glorifies death and destruction. Islam has promised mercy toward us only if we convert to their belief. We did not start this war, but if we want to end it without losing our lives and our culture, we meaning both America and Israel had better get serious about fighting it on all levels, including the battle for minds and hearts. I see this little flick as akin to a single bullet in a huge battle insignificant in-and-of-itself, but potentially a complete game changer, if it can with God’s help find just the right target.Keep up the good work folks, and may the Source be with you. I’m puzzled that only Darwish is studied in Israeli schools and venerated by the local literati. If I were Abbas, I’d take Israel to court and demand I be studied too. Didn’t I deny the Holocaust? Don’t I want to kick out the Jews? And I’m sure I can write Darwish’s kind of so-called poetry no worse and probably better. It’s unfair and discriminatory to prefer him to me. There are also neofascist leaders and other honourable men world over whose attitude to Israel and whose literary talents can rival Darwish’s! Why him and not us? What a stirring piece of writing, but unfortunately, it’s like preaching to the choir. The choir already knows the theme of the message and agrees to the content. It is those on the “outside” that need to be moved. Can that happen? Probably not with all the roar in the background of those we commonly call the “left”. And I would seek to enlist those who are now tagging onto Obama’s back, thinking that he has taken a step to recognizing Israel, don’t be fooled! Watch his actions, not his words or charismatic presentation. Israel has friends, and I am one of them, but the enemies are louder and in places of control. Those in your own Kinnesset are a danger, but they keep right on stirring the pot against their own country. How can it be? Obama is not Israel’s friend! Watch out!! One consolation – God watches over Israel and won’t forget His promises to you, His chosen people. Don’t forget that! Kol Hakovod – why is it that our political leaders (ie current and past Israeli government ministers) don’t have the guts to say this and leave it to the excellent journalists like Sarah? Is it they don’t like the truth – the same could be said of our Rabbonim who want to hide this all away and deal with petty matters rather these major items. We need a strong vocal majority who will come out on the streets like the “social revolt” events who when hit in their pockets come out in there masses, we are now being hit on all sides and our people remain lethargic – just like in the 1930’s when they believed the Jewish Establishment. Then there was nowhere to go – now we are home we have to stay here and fight against the wicked world leaders who wish to destroy us all. I am extremely impressed by your writing and observation skills. You simply MUST keep writing along these lines in order to educate a very uneducated biased world view of Israel as well as Jewish history. The Jewish heritage MUST be defended always and lies against it exposed! No, I am not Jewish….I am a Canadian, born in Norway. Please keep writing and fighting for what is true and truthful. I’m hearing the voice of truth. About the Arab denial of the existence of our Temple. It is true that there is no scientific archaeological proof of any part of our history concerning King David and Solomon. However, faith in these events have fed believers for centuries and centuries. Today, a new original theory, based exclusively on the very words of the Bible, demonstrates that the First Temple was indeed built, containing the Ark of the Covenant, in a way that the Ark could not be detected even in the case of destruction of the House.